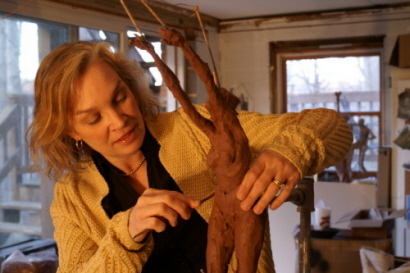 2007, Swenholt sculpts standing terracotta, Seeing (The completed sculpture can be found in the Spirit, Skin and Bone portfolio) using a Luchesi fork as the external armature. I think of the world as a beautiful nest for our souls. My view of man’s function in the universe is optimistic and respectful but I also realize this life is dangerous. Loss is right around the corner for us all. My work reflects these tensions as I seek to make little monuments to man’s passions and to my understanding of God’s role in the world. Stylistically, I am drawn to layers of visual beauty and meaning as found in works by Goya, Manuel Neri, Munch, Velasquez, Rodin, Michaelangelo and expressionistic art such as the Grunewald Altarpiece. My favorite art is like nature. It learns from nature. It should take awhile to sink in, be fairly inexhaustible, and have something to see that surprises even after years of living with it. Early in my career, I worked with an Emmy award-winning designer on motion graphics for a major television station. There I learned to layer beauty and stimuli. We would spend forty to sixty hours laboring on visuals that would be seen for thirty or sometimes as few as seven seconds. We would plant gems-things that sparkled which the viewer would see for only fifteen frames, about half a second. Only the designer and I, while lovingly reviewing our video in slow motion knew all we’d embedded in it. But while I layer beauty into my work, I also work ideas within it. Art is a language of it’s own that can be read and understood similar to dreams. As I sculpt, the seed of memory or truth that first inspired matures into meaning side-by-side with exploration of the form. This dual search for beauty and truth acts as the legs that take me from initial inspiration to the completion of the piece. Word accompaniment: Some sculptures are accompanied by lyrical captions. Visuals in the 21st Century seldom exist without words and I am a artist of my times. I liken these "captions" to song lyrics which do not stand alone, can be roughly expressed, but can still enrich the music it accompanies.